JC1604. Close up view of the vug. JC1604. Close up of hubnerite on back side of specimen. JC4284. Back side of the scalenohedron. JC4284. Another view of the specimen. JC5915. A closer view. 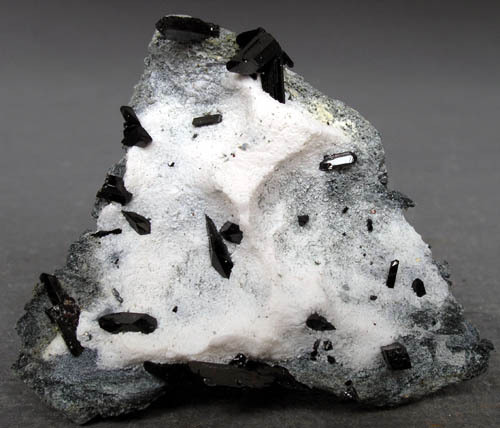 The patch of benitoite crystals can be seen in the lower center portion of the specimen. JC5888. Reverse side. The neptunite was in contact with a crossite vein, so that the crossite included the neptunite, leaving the red color that is the real color of neptunite. Quartz on calcite The following are selection of the best specimens from a new find in Reno, Nevada. These are unique in my experience, as I have never seen anything quite like these before. They are somewhat dull to satiny luster calcite, mostly as scalenohedra, some as more rhombic in form. Scattered on and around these calcite crystals are brilliant, diamond like small quartz crystals in what I call "starburst" groups and sprays, where the quartz radiates out from a central crystallization point. Sometimes the quartz is stubby, and sometimes more elongate. Many of them are sceptered. They sparkle beautifully and present well. All are pretty specimens. They were carefully collected and most have no damage except on the periphery where they were broken loose from the veins. No one else has these, and they are exclusive to my site. Their location is in the Virginia Range, in Reno, Nevada. JC5520. A close up of the center and right side. JC5569. A closer view of the left side of the specimen. JC5580. A close up of the top center area. Note the scepters on the quartz. JC5617. A closer view of the central area. JC5646. Close up of the upper right.